What an amazing whirlwind my first 3 months in Scotland has been! Please bear with me while I catch up on posting. Winding back a little to Vancouver, in January after another busy holiday season working at Edgemont Fine Wines, Spirts & Ales I realized I really needed a “break” and that certainly wasn’t going to happen until I had packed up my life and got to Scotland. So instead of taking the job-hunting approach of trying to get a job before arriving in Scotland, I decided to take the opposite. I felt the need to explore the country some before deciding where I would live and work. In discussing these new feelings and other updates with Emmett at our next meeting he mentioned that he could connect me with the Spirit of Speyside Whisky Festival organizer, Mary Hemsworth, to see if they needed any volunteers for the festival at the beginning of May. Perfectly Feis Ile, the Islay Whisky Festival, is held at the end of May so the offer Anthony Wills, founder and owner of Kilchoman Distillery, had made me during an informational interview to have an experience at the distillery for 2 weeks could fit at the end of the month. What better time to offer my help then this very busy festival time where hundreds of whisky visitors visit their distillery on one day! I reached out to both and all fell into place. 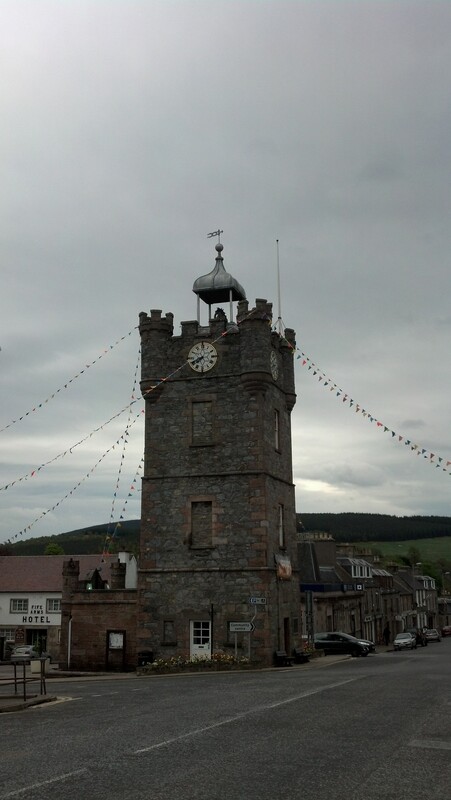 So there I was in Dufftown, ready to have a very different whisky festival experience than I am used to…in a whisky region!! The Spirit of Speyside Whisky Festival is huge and has over 400 events all over the Speyside region! This year for Scotland’s Homecoming they also launched a music festival to run alongside it so there were more activities for guests to do in the evening after a long hard day of enjoying whisky. Part of what makes this festival so unique is that a large majority of the events are organized and held by individual distilleries, businesses or people all over the whisky region of Speyside. One of the events the festival organizes themselves are the whisky awards and this year they decided to take them on the road to different towns all over Speyside with some dates before and many during the festival. Once I arrived in Speyside, I did my 2 hours of required liquor training with Penny Ellis, a Festival Director, at Knockomie Hotel in Forres (which of course has a great little whisky bar). She runs the awards, in addition to the hotel with her husband Gavin Ellis. I learned some of the oddly different liquor rules in Scotland. The legal age to buy alcohol is 18, but once you turn 16 years old you can purchase liqueur chocolates! Woot, woot! So I guess if you were 16 and so inclined you could do your best to try to get drunk off of liqueur chocolates??! Uhhhhhh, wouldn’t want to experience that hangover or maybe it should be called a sugar crash? If that is not appealing, at 16 you can also go to dinner with anyone who is 18+ year old and have a beer, wine or cider with dinner, IF they buy it for you. It actually was pretty interesting seeing all the little differences in the liquor laws here. Anyway, back to the awards…distilleries enter their whiskies into the competition and a group of judges narrow down this group in a blind tasting to just 8 whiskies. There are 4 categories so in the end it is a head-to-head match in each category, separated by age and one category for distillery special editions. Now the festival attendees who go to the award events get to take over the judging to decide the winners! I went to the first awards event in Keith and we set up for the tasting. All pretty straight forward stuff that I have done a ton of times but I had the pleasure of working alongside a number of people who have been in the whisky industry for years so it was a great opportunity to ask questions and hear about their experiences! The awards are self guided, so during the down time while guests were tasting Penny handed around some employment forms to everyone and then told me that the festival decided to pay me. What a pleasant surprise and my first job in Scotland!!! So now I was getting paid to work at the awards all over Speyside. Fun! It was very interesting seeing how the voting at the awards played out with the favourite in some categories going back and forth from one night to the next, possibly from groupthink. Another involvement I had with the Spirit of Speyside Whisky Festival was working at their Information Hub in Dufftown for three days throughout the festival. This is where we assisted festival guests, who came from all over the globe for the festival, with any inquiries they had. It was great getting to meet many guests and hear about their festival experiences. Luckily I did get to squeeze in attending a few festival events, two of them being International Women of Whisky Day (#IWOWD) events! This year the Spirit of Speyside Whisky Festival declared the first International Women of Whisky Day to recognize the growing number who enjoy whisky and the increasing number of women who work in the whisky industry. How special to be there to participate and celebrate in person with many women involved with whisky that I admire. Of course it wasn’t just women at the events. About half were men, which was great to see that these events were successful attracting both genders. The first tasting I was able to attend after working at another awards event was Annabel Meikle’s (@TheWhiskyBelle) “Test the Senses”. Annabel has worked in the whisky industry for 12 years and has been involved with writing the tasting notes for The Scotch Malt Whisky Society so she is well equipped to test our senses. 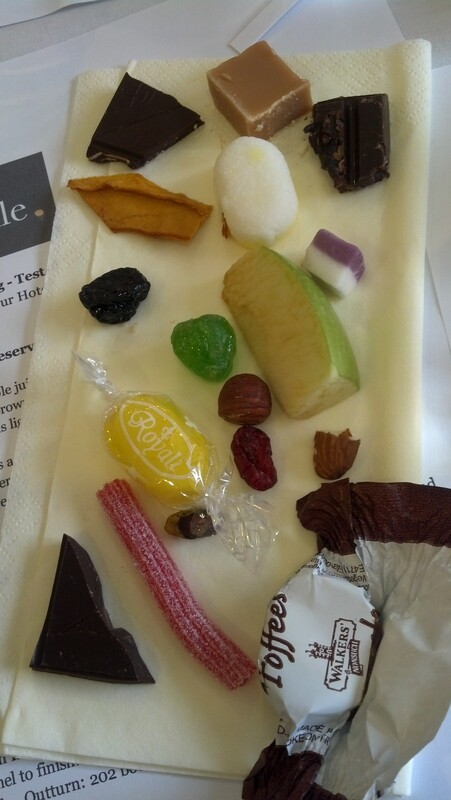 I always love sensory training and Annabel is a great speaker so this was a lot of fun. Many little goodies were la id out for us to n ose and taste, including some UK-centric ones that helped my North American palate out. We tasted 3 of the 5 whiskies blind and had to create tasting notes for the first two within small groups. The last blind whisky we tried was listed on the tasting mat as “Glen Moray cask sample” so we had a hint, but had to throw up our hands to describe what we were nosing and tasting. Of course Annabel threw us a curve ball with a sample she got while visiting the distillery of some Glen Moray that was aged in an Islay cask! 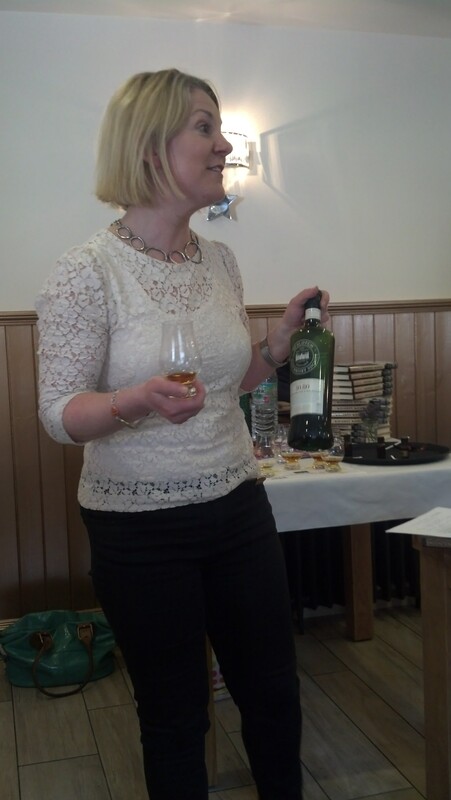 Next up was Angela D’Orazio’s (@AngelasShare) Mackmyra Swedish Single Malt Whisky tasting. Angela is the master blender of Mackmyra; the first Swedish whisky distillery which was established in 1999. This was my first experience with her whiskies since they are not available back home in BC. I had no idea what to expect and was a little worried as the first whisky felt a little young but the other 4 blew me away! They were such diverse, interesting whiskies! I love that they are using some casks that have been seasoned with local Swedish wines, even a mulled wine. Some of what we tried has not been released yet. I had a hard time picking favourites between Midvinter, Moment Malstrom, and Svensk Rok. 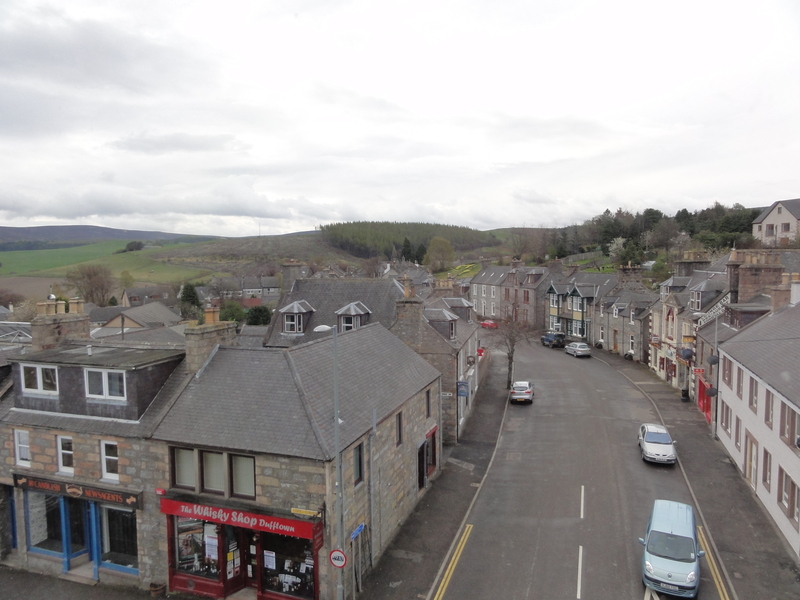 The final tasting event I was able to attend was the Drams Party at the Dufftown Whisky Shop. I had heard varying opinions of this event, but I am glad I attended to experience it first hand. 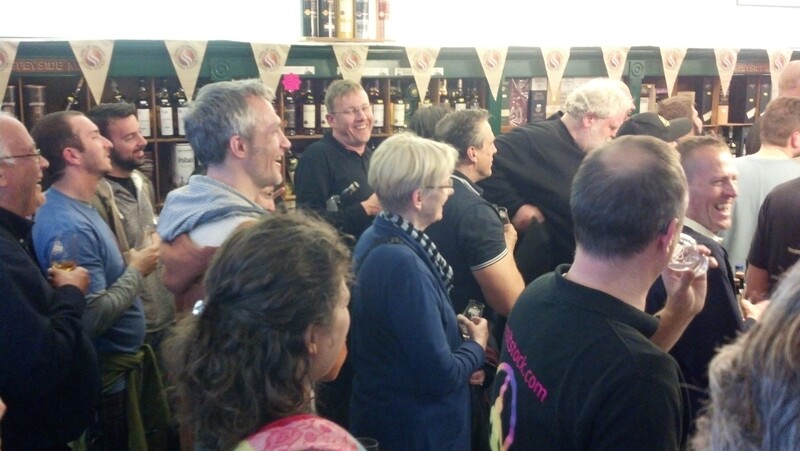 Crammed into their shop like sardines may not be everyone’s idea of a good time but when you are among many friends, who you have seen briefly here and there throughout the weekend, what better way to finish off the festival than together in a relaxed, pour your own whisky environment! When we walked in we were told to blindly grab two little sample bottles from a large basket. So I reached in and grabbed “Single Malt Islay 4” and “Ireland 1”; a fun, take home gift. I still have no idea what these whiskies were! 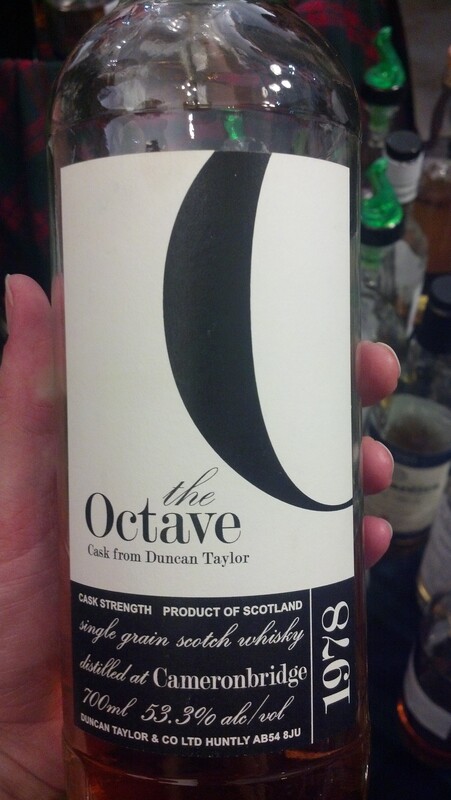 The quality of many of the whiskies at the event were above and beyond. Many were heels from the shop’s festival events and some were heels they didn’t need to keep around the shop anymore because the whisky had sold out. I tasted 5 single grain whiskies back-to-back! How often do you get to do that? With maybe 15 minutes left in the event I was very behind on moving on to the peaty whiskies, so I asked the store owner, Michael Lord (@WhiskyLord), what he would suggest if I was to only taste one or two peaty whiskies. He peered through the bottles and grabbed an independent bottling of Laphroaig and told me to take it home with me. Wow, that was a special surprise! Maybe not so special after all, as within 5 minutes he started grabbing heels and shouting things like “who wants to take this heel of Littlemill home with them” and handing them out to guests who responded. It felt like an auction but no one had to pay. Talk about creating superb customer relations! Of course we couldn’t resist having our own little whisky fabric gathering one morning for a wee “skalk” before the festival day got started! Any chance I could throughout the festival, I would spend whatever little bits of time in between shifts exploring the area or taking small back roads to see some different views. Of course many distillery and whisky related visits were included in this! More on these in future posts. It definitely turned out to be a great, inside experience at the Spirit of Speyside Whisky Festival. I look forward to next year!